Engineers did such a good job with the 2018 Kia Sorento that they didn’t have to do much to maintain its immense appeal to midsize crossover buyers. The previous version was usefully sized, attractively styled, and came with a ton of features, as well as Kia’s industry-leading warranty coverage. That trend continues for this year, as the 2019 Kia Sorento has only received minor adjustments and a model lineup simplification. 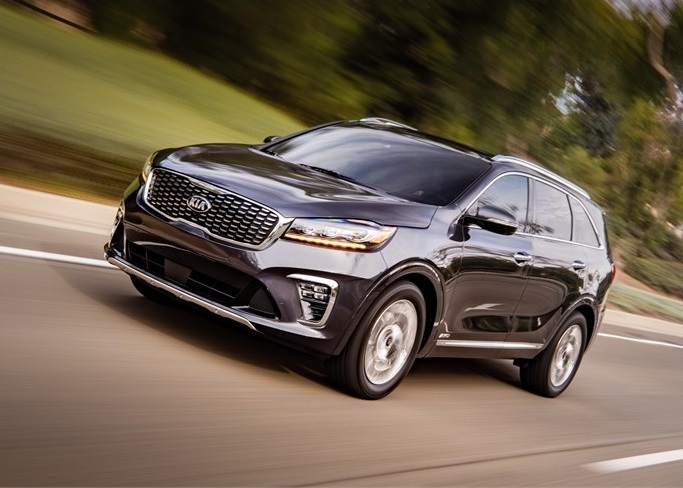 Read on to learn more about the 2019 Kia Sorento vs 2018 Kia Sorento comparison, and come to Glassman KIA, our dealership serving Auburn Hills Clinton Charter Township, to see them for yourself. At first glance, it’s tough to tell what’s been changed between the 2018 and the 2019 models. However, there are some updates, albeit very minor. In the front, the lighting cluster has been revamped so the turn signal LEDs now rest beneath the headlights. On trims with LED marker lights, those on the lower air dam have been made slightly smaller. Meanwhile, the grille largely retains its shape, but it has been incrementally redesigned as well. In the rear, the taillights have been tweaked as well, but they (and everything above bumper level) retain their shape. Again, the changes are difficult to discern. The Sorento’s steering wheel now comes with four spokes, and as always, it’s very comfortable to hold. The shifter head is new as well, and the instrument panel’s graphics are a little bit different. 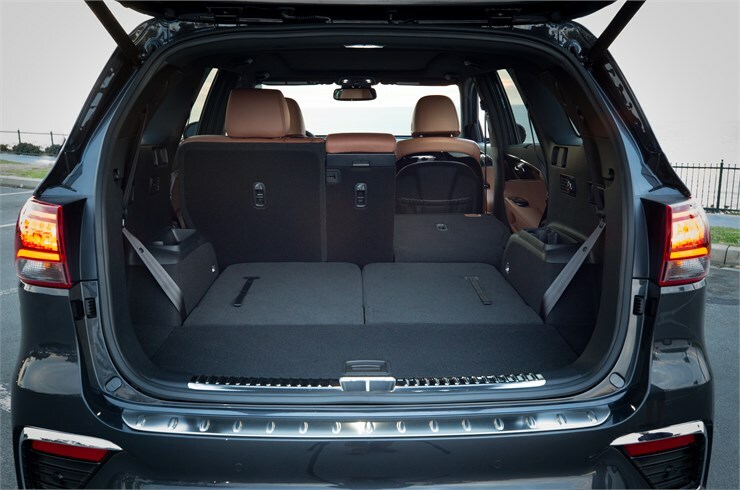 While the 2018 Kia Sorento came with two standard seating rows (and an optional third row), the 2019 model now has standard three-row, seven-passenger seating. 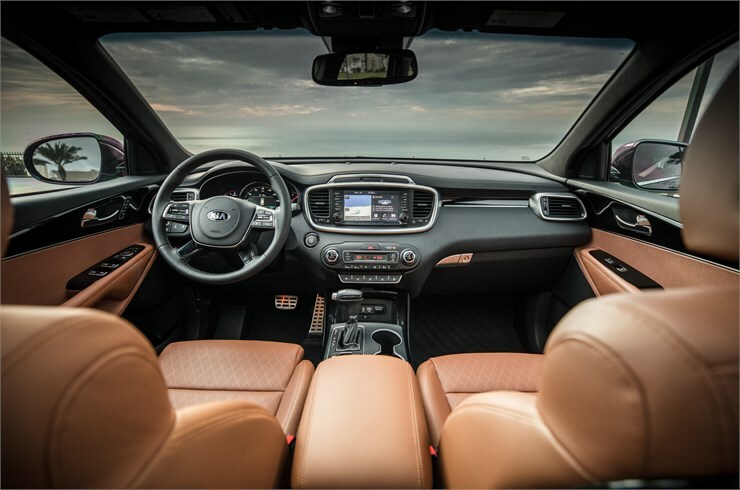 Aside from the terra cotta color that’s available on the 2019 Kia Sorento SX-L, either model’s cabin is quite impressive in terms of quality and design. The 2.0L turbo four-cylinder that was available on the 2018 Sorento has been discontinued for this model year, as buyers much preferred the V6 engine as an upgrade. That engine puts out 290hp and 252 lb. ft. of torque; it’s paired with an eight-speed automatic instead of the 2018 model’s six-speed. Fuel economy has improved slightly, making the new model an even better value. For 2018, the Kia Sorento LX and L came with a standard color display and radio faceplate. This year, all Sorentos come with a seven-inch touchscreen as standard equipment; an eight-inch screen with navigation is available. Both options include Android Auto and Apple CarPlay, and the top-of-the-line SX and SX-L now come with wireless device charging. The Sorento’s suspension remains quite comfortable, even with larger wheels, and there’s little rebound over bumps and lumps. Back-seat passengers will find it amply roomy, although the tallest riders may be slightly cramped. As far as handling is concerned, the Sorento is very competent, sharp, and engaging. The V6 engine offers strong power, and we recommend it as an upgrade. It will come up to speed smoothly and with little fuss, even with three adults and all their gear. The all-new eight-speed automatic transmission is very responsive to the driver’s input, and it won’t get lost in its gearbox during downshifts. While all Sorentos come with most of the expected safety features, the most advanced technology is unfortunately restricted to the uppermost trim levels. Such features include auto emergency braking, forward collision warning, rear cross traffic monitoring, blind spot monitoring, and lane departure warning. 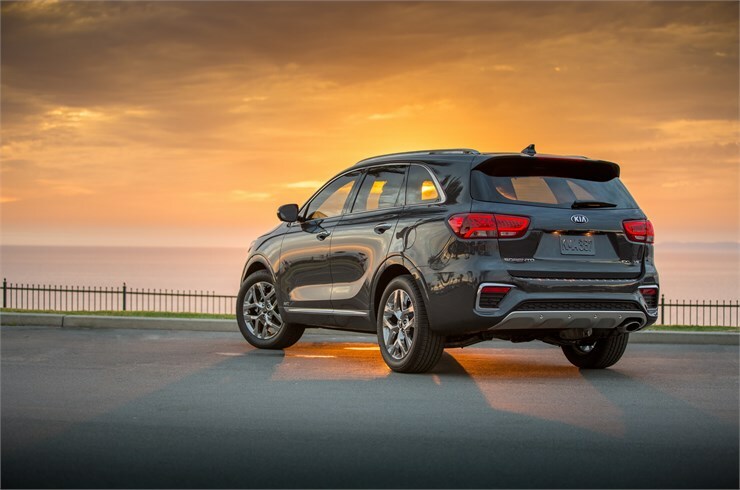 The 2019 Sorento now comes with a driver inattention notification system as well as lane keep assist. In the 2019 Kia Sorento vs 2018 Kia Sorento comparison, both models have antilock brakes, stability control, six airbags, and a backup camera. In crash testing, the NHTSA gave the 2018 Sorento a five-star overall, side, and frontal crash rating. The IIHS (Insurance Institute for Highway Safety) gave it the best possible rating for crash prevention and protection, as well as an Acceptable headlight rating. When combined, these ratings helped the 2018 model earn a Top Safety Pick designation, and the 2019 Sorento is expected to get largely the same results. The eight-speed automatic and V6 engine combo is the most crucial update for the 2019 model year, and the slight fuel mileage improvement is an extremely tangible benefit that crosses trim levels. Greater feature content and minor styling changes on the highest trims are also worthy of consideration. Therefore, if you can find a great deal on a 2018 Sorento, you probably won’t be too upset that you didn’t choose the 2019 version. Either Sorento model is a great choice for value-conscious crossover buyers, and we invite you to call us for more details or come down and see them in person. 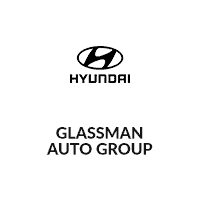 Visit Glassman KIA, our dealership serving Auburn Hills Clinton Charter Township, to compare the 2018 and 2019 models and to take a test drive.